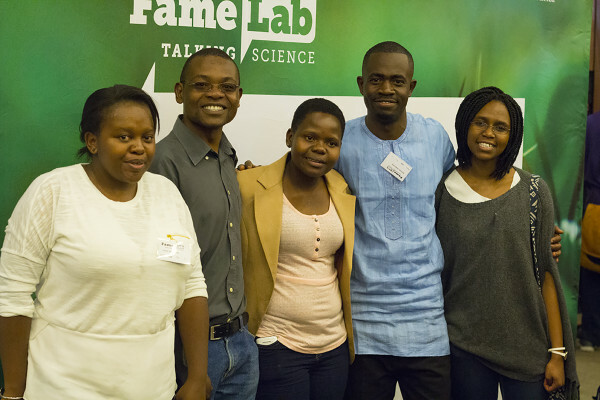 Four Wits University students showed off their science skills at the FameLab SA semi-finals. Wits’ future scientists showed off their innovative research projects at the semi-finals of the FameLab South Africa science competition last Friday, March 24 in Solomon Mahlangu House at the Wits main campus. FameLab is one of the biggest science communication competitions in the world. Dubbed the “pop idols of science”, the competition brings together students from a variety of disciplines including engineering, technology, medicine, physics, and mathematics. Wits was reprsented in the competition by Lungile Khambule, a first year PhD student and lecturer from the department of Chemical Pathology, Michael Bodunrin, a PhD student in Metallurgical Engineering, Aviwe Matiwane a second year PhD student and Phylis Makurunje, both of whom are from Wits Center of Excellence (CoE) in Paleosciences and Strong Materials. Matiwane, a PhD student, discussed the fossil plant Glossopteris which existed 300 to 252 million years ago. Her research focuses on finding descriptive features on the fossil plant that can be used to identify and name these plants thereby creating an international database for scientists around the world working on fossil leaves. Matiwane told Wits Vuvuzela that there is not much known in the field of palaeoscience among the South African public even though fossils are part of our national heritage. She added that, “the public may know about dinosaurs however, not about the plants.” Matiwane wanted to be part of the FameLab experience to show that working with plants is just as exciting as working with ‘big teeth’. She hopes to become the first black female paleobotanist once she graduates. Makurunje, a PhD student in strong materials, focusses her research on aerospace materials and working towards increasing the speed of travel by using materials that can handle such harsh flight conditions. Makurunje told Wits Vuvuzela that entering Famelab was a good break from the intense science lifestyle of reading and experiments. “The most important thing though was about getting to learn how to really talk about science in a way that appeals to anyone, even people without a science background”, she said. Both Makurunje and Matiwane, along with Bodunrin have been selected as part of the 10 final contestants who will be competing on 19 April 2017 for the top spot at FameLab SA.